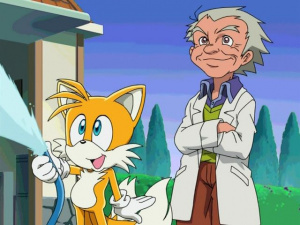 Tails and Chuck Thorndyke from Sonic X.
Chuck Thorndyke is Chris Thorndyke's grandfather in the television series Sonic X. He appears to be partially modelled after Sonic's "Uncle Chuck" that appears in SatAM and other Sonic spin-offs. He is adept at technology and helps Tails with his devices; Chuck even shares his underground lab with him. He is normally good-humoured and witty but has been known to act nuts when overexcited. This page was last edited on 2 October 2011, at 19:34.